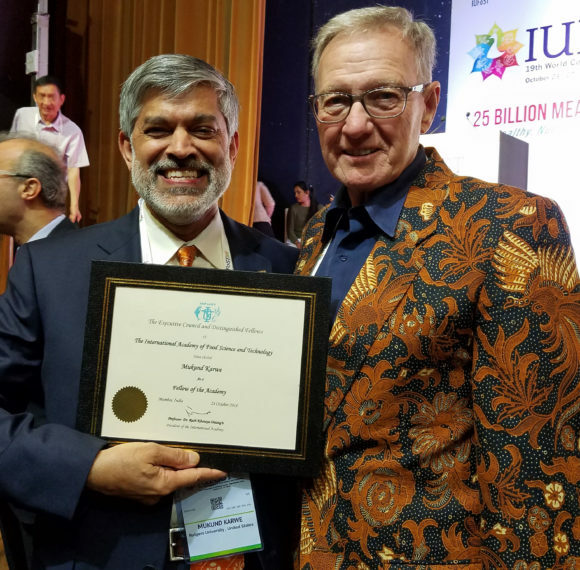 Share the post "Mukund Karwe Elected a Fellow of the International Academy of Food Science and Technology"
Mukund Karwe, left, with Darryl Lund, former dean of Rutgers Cook College and former chair, Department of Food Science, at the 19th World Food Congress in Mumbai, India. Mukund Karwe, professor of food science, was elected a fellow of the International Academy of Food Science and Technology (IAFoST)—one of 20 new fellows and two from the U.S.—to be inducted during the 19th World Food Congress held in Mumbai, India, from October 23-27. The academy is a statutory component of the International Union of Food Science and Technology (IUFoST), which is the global scientific organization for food science and technology representing over 300,000 members from more than 75 countries. IAFoST fellows are acknowledged by their peers as outstanding representatives of international food science and technology. 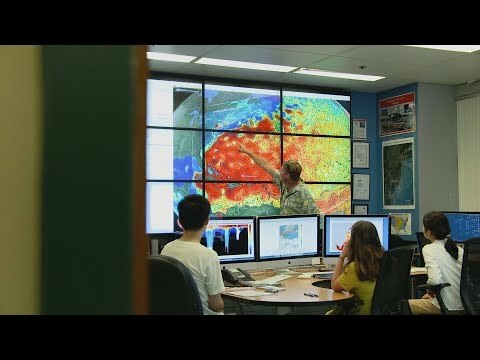 They work independently to promote high standards of ethics and scientific endeavors and are at the forefront of IUFoST, helping to strengthen global food science and technology for humanity. 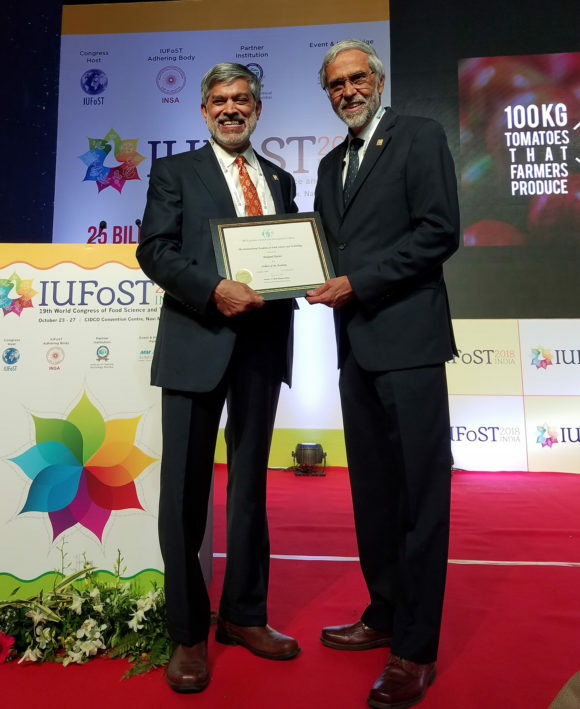 Mukund Karwe, left, receives his certificate from Dr. R. Paul Singh, president-elect, International Academy of Food Science and Technology. The five-day congress brought together researchers, academicians, professionals, policy makers and industry leaders from across the globe to showcase innovation, exchange breakthrough ideas and discuss policy issues. Its theme, “25 Billion Meals a Day by 2025 with Healthy, Nutritious, Safe and Diverse Foods,” reflected the key concepts of recent advances in food sciences, food processing and agriculture technologies. IUFoST organizes world food congresses, among many other activities to stimulate the ongoing exchange of knowledge in scientific disciplines and technologies relating to the expansion, improvement, distribution and conservation of the world’s food supply. Karwe, who serves as editor of the Journal of Food Engineering, is also a fellow of the Institute of Food Technologists and dean of international programs at the School of Environmental and Biological Sciences.